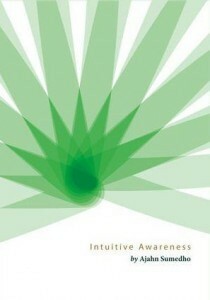 Intuitive Awareness is compiled from talks given mainly in 2001 by Ajahn Sumedho; they convey an intuitive understanding of the Buddha’s teaching which has arisen from over 35 years of practice as a Buddhist monk. Ajahn Sumedho’s approach starts with accepting ourselves as we are. By doing this a relaxation can take place that creates space for insight to arise. For some people this space arises as the sound of silence, or simply a quiet or empty mind. However it manifests, this points to the unconditioned; beyond body and mind objects. From this place of spaciousness, social and personal conditioning can be investigated or reflected upon, thus freeing the heart from the delusion of identifying with the personality. ven Ajhan Sumedho Bhanteji, vandan, kindly teach me all steps of practice on the way to THE NIBBANA.